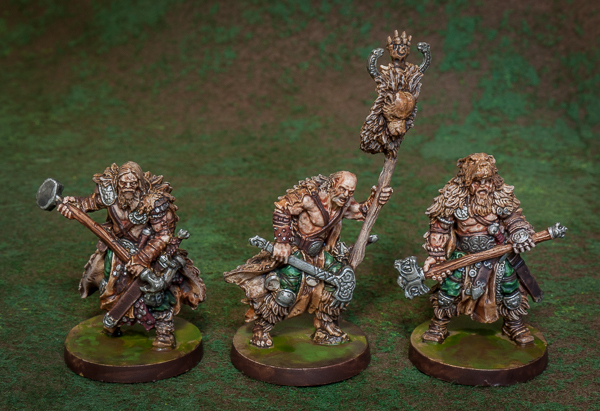 I painted these figures as a little experiment - to see how the pvc miniatures would look after my usual speed painting techniques. 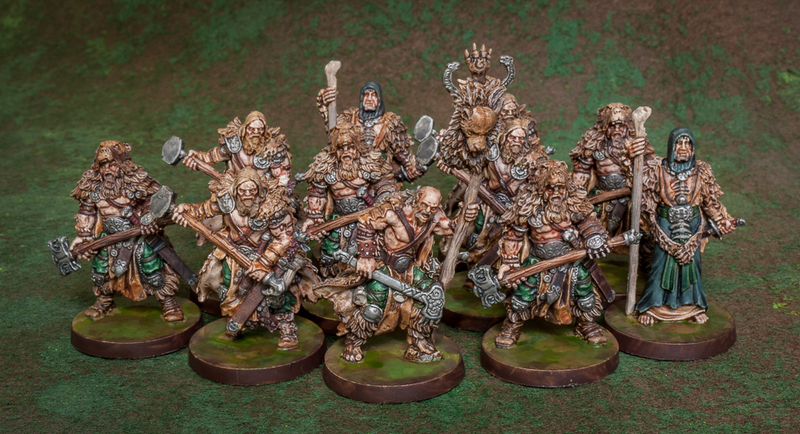 These are the Blood Rage bear clan, consisting of a leader, eight warriors (in just two poses) and two mystics. The first thing I did in preparation was clean the figures of mould lines. I used a knife blade rather than a file, the material is very soft and easy to cut, with such small details you have to be careful you do not remove too much sculpted material. Luckily, the mould lines were usually hidden away and not too visible. Next, I glued a penny into the base. This acts as a weight to keep the figure upright. If you use UK currency it's also magnetic, which can be useful if ever you want to rack them up on movement trays. After a soapy wash and drying, I spray primed them white, then washed with a brown to provide a rough guide to the details. Most of the painting was very basic - thin coats, washes and drybrushing. I did zero highlighting. Even the bases are very basic paint washes slapped on. I think the end result is fine - nothing amazing, but decent enough for the basic techniques used. On the whole, I would say the pvc takes the paint in a similar way to all my other figures, mostly like painting resin - any bare patches that are missed by primer can be a little resistant to paint adhesion. There are tons of detail, but none is as sharp as any other material. For some reason I cannot explain, I do not particularly enjoy painting the pvc figures, there's something about the softness that I find saps my usual enthusiasm with the brushes. The end result is fine, but the road to get there is a chore. Still, it's a few less minis in an unpainted state, which has to be a good thing. I thought the easiest way to celebrate my ten years of blogging was to pick something from each of the years, starting back in 2008. This first year I actually started the blog in June, so there's less to choose from, but I still managed to find three contenders. 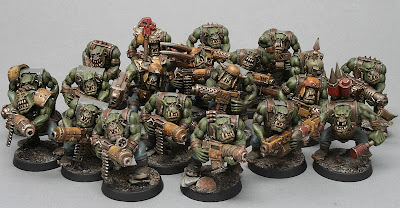 I painted a Norse team for Blood Bowl and a few regiments for my Warhammer Orcs and Goblins army, but my pick of the (half) year would be these ork shootas. They were the start of a new foray into this ruleset. I never quite got to grips with the 40K gameplay, I found it far more fiddly than the fantasy rules. In recent times I have enjoyed playing the orks using one-page-40K, but sadly these boyz have been in storage for the best part of the decade. As a celebration, a ten year old snap is a little lacklustre, so I have dug out the boyz and persuaded them to pose for a few more photos. The whole force was painted in fits and starts over a couple of years, with many units left abandoned as grey plastic or still in the boxes. Shame really, as there are some really nice models here. First up, the original mob of shootas, with a nob (boss) and the warlord in the background, persuading the boyz to get stuck in. The yellow was chosen as something I would not usually paint, and also as a less frequently seen ork clan the Bad Moons. According to the fluff, this meant more shootas than usual, hence this first unit. The Bad Moons are the richest ork clan and thus have plenty of equipment. 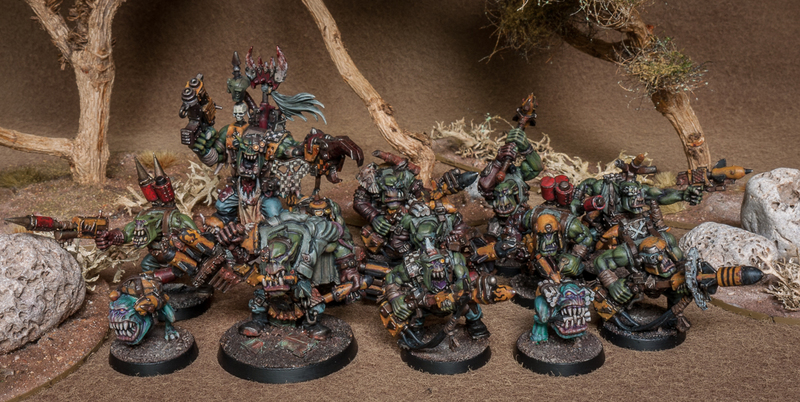 So I gave these ard boyz some serious amounts of armour. If memory serves, these are all converted from various plastic and metal bits, some fantasy parts in there too. They have a truck that is 90% painted, just waiting for the final touches. 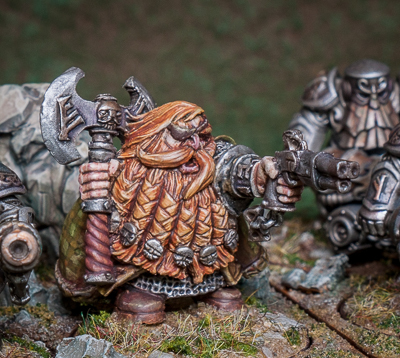 Finally, my favourite unit of the force, both in gaming and painting terms. The warboss is a lovely model, seeing this figure was one of the main reasons I started collecting orks in the first place. And I just love the squigs, which I painted in a funky blue to contrast with the yellow. 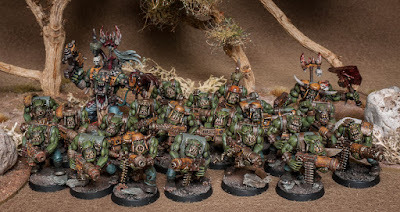 There's far more sat in storage waiting to be loved again - nobz, deffkoptas, burna boyz, grots, lots of standard boyz, a few meks, kans.........maybe in the next ten years they will get finished. I was flicking through some of the older posts in the blog, looking for something from days gone by, when I suddenly realised that I have been writing this nonsense for ten years! A little bit more in fact, as I started blogging in June 2008. 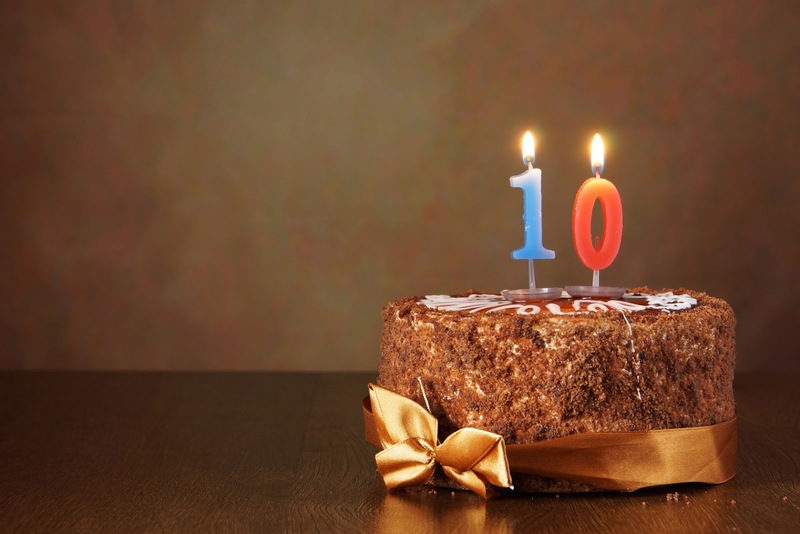 A little celebration is surely in order, so help yourself to a slice of cake. I will be marking the occasion by trawling back and showcasing some of my hobby highlights from the last decade. I will get the first of these celebrations on the blog over the weekend. Remember these movement trays? I picked them up from warbases some time ago. The slots are 2p sized and the little holes fit a 5mm magnet. I finally got round to adding the magnets. Super glue didn't seem to work as the fit was quite loose, so I used a little green stuff on the bottom of the tray. I originally bought them in this 2x2 configuration because I thought most of the time I would be playing with either 4 or 8 figures to suit Saga gaming, or 12 figures to suit Dragon Rampant. Now that I know they work, I have ordered some more, but at size 3x2. When loaded up with figures they look rather nice. 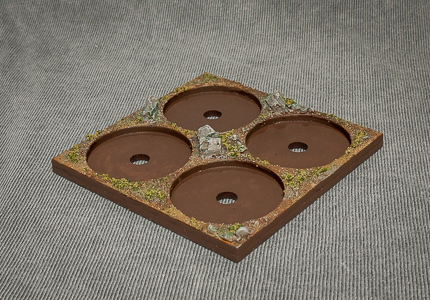 I should really stick with one basing style across all my armies, then I could use one set of trays for multiple forces. However, I do like to change the bases for each project - the dwarfs have a rocky, mountainous look for example. The hold of the magnets on the coins is really strong. I can hold these upside down and they hold fast, even the metal figure in the centre. Though not too strong so it's impossible to remove them from the tray! So I can pop them out for skirmish games, or leave them ranked up when required. 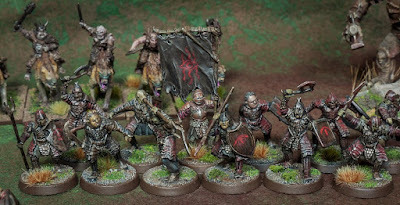 Spurred on by my recent quick paint job on the Mordor snaga, I had a look through the part-painted projects, hoping to find something that would be easy to complete. 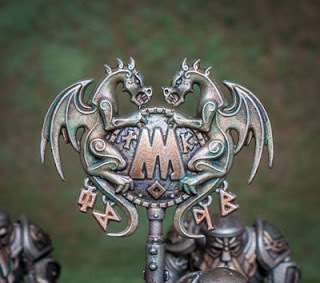 You probably know how this goes - you start a project, get a few models/units painted with great enthusiasm, then it tails off and you start something else. Then something else again, and again, until you have several projects in various stages of (non) completion. Eventually, there comes a time to return to that almost finished job. Today it was time for Eomer to finally ride forth! There were three models to complete here and they were about 90% done. I just had to finish a few details, mostly Eomer's red leather armour, and then tackle the dreaded banner. Having forced myself to practise on freehand recently, the design came quite easily, though matching it on each side of the flag was a challenge. I think it turned out okay in the end. Not bad for an hour's work on a dreary Sunday afternoon. 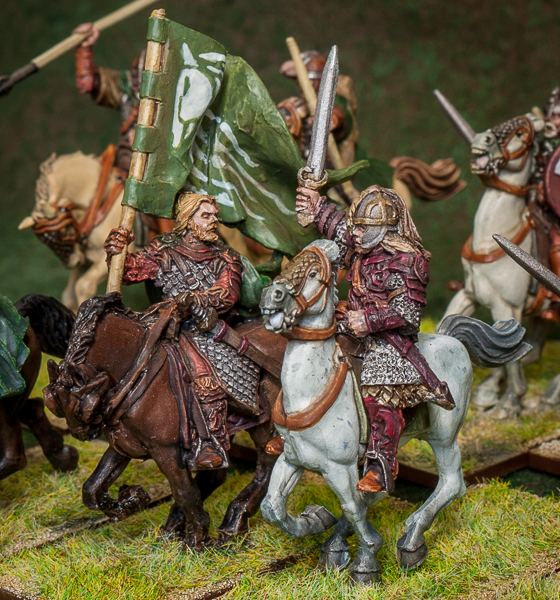 The Rohan force now contains two units of six knights, ideal for Dragon Rampant. In Saga games they would probably be used as elite units, so three units of four. Along with two/three units of infantry, there's just about enough for gaming with these figures now. Every time I paint some of my Lord of the Rings collection I like them more and more. Snaga is a term used by orcs for lesser of their own kind, or slaves. They are usually smaller, less able to wield a weapon in combat and often equipped with bows. 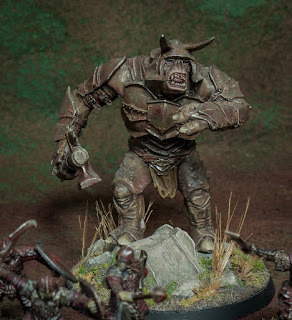 I wanted some in my Mordor force, but not the standard bow armed orc models. There's not much chance of me getting the old metal models, so I went with some Moria goblins. In Tolkien's world, orcs and goblins are all the same species, there's no real distinction, not even a size thing. 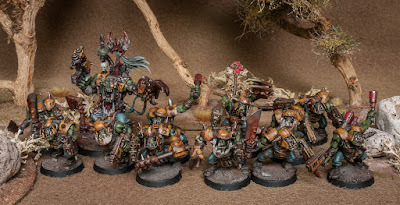 So while they are officially goblins, they pass as orc snaga in my eyes. 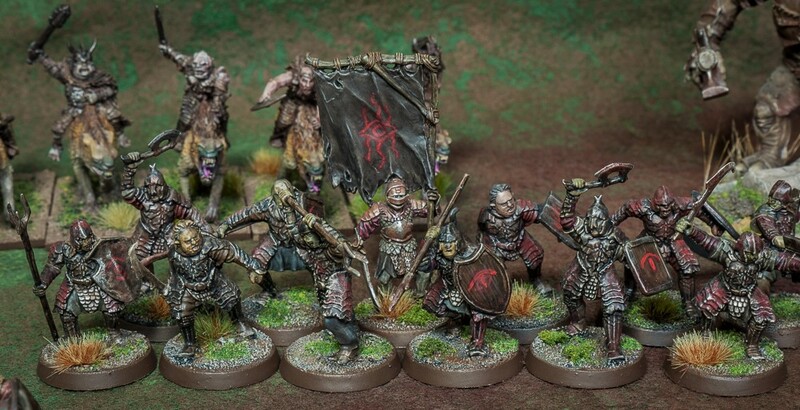 There's twelve in the unit, so they can be used in both Dragon Rampant and Saga games. Unfortunately there's not much variety in the poses - though arguably all bowmen look the same when loosing their arrows. I didn't want to spend much time on them - I picked up these on ebay already painted and just painted over them. It's cheating I know, but they were very cheap and it saved me some time. More reinforcements for my Mordor force on the way. 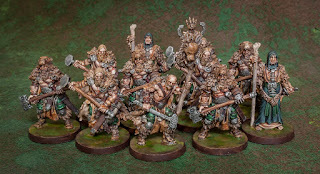 A few days ago I played a game with this force and thought it was high time I photographed them. 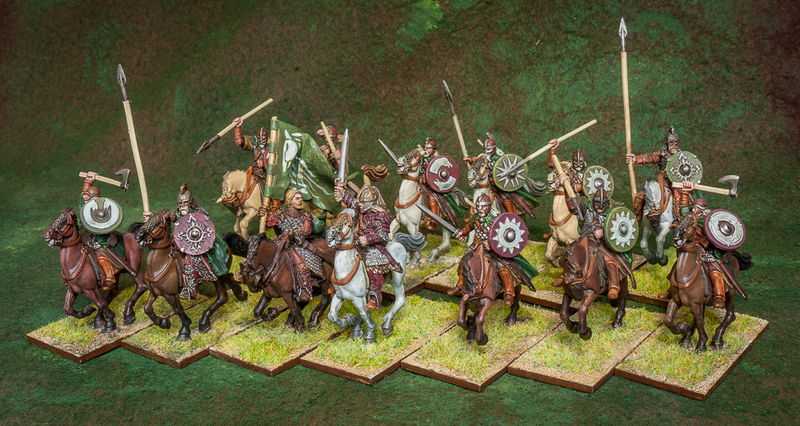 It's something I had painted a few years back but have seldom had the opportunity to use on the field of battle. It could be used, of course, in Lord of the Rings strategy battle, or War of the Ring, or even Saga, but for the most recent game we played Dragon Rampant. Units are allocated to one of about a dozen profiles, some can be given upgrades or fantastic traits. The backbone of the army was two units of Morannon orcs, which I fielded as heavy foot. These are not the best infantry in the game, but are pretty competent. Foot troops tend to be statted in a defensive way in the ruleset, so I gave these units the offensive upgrade, which makes them effective on the charge. I gave each unit a banner to further differentiate them from the common rabble - this is purely a visual thing and has no effect in the game rules. One of the units contained the force leader, Dagalur, seen on the left in the photo below. There was also a couple of units of lowly orcs, which I designated as light foot. These troops are reasonable enough, especially if they "form ranks you maggots", or form a shield wall in Dragon Rampant terminology. This makes them a static but very effective defensive unit. The cheapest unit on the battlefield were these scouts. Useless in combat, they are quite mobile and can be very annoying if they can get themselves into terrain from which they can shower the enemy with arrows. Fun Fact - if you give them the cowardly downgrade, they become zero points! "stick em with arrers lads"
There's nothing small or cowardly about the Mordor Troll. I fielded him as a greater warbeast with a fear upgrade, though this turned out to be quite poor in truth. For some reason I cannot fathom, greater warbeasts are absolutely rubbish at defending themselves. In future games I would probably go for heavy horse with some upgrades to make him scary and perhaps more effective in combat. Finally, for some fast moving action I added a unit of warg riders, which I fielded as heavy horse. 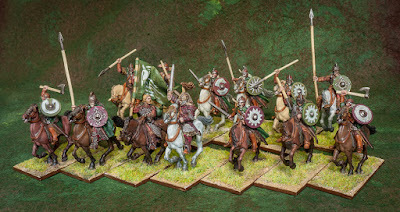 Again, not the best mounted troops in the game, but not the worst either, which seems about right to me. 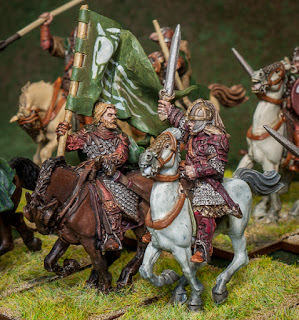 Warg riders - heavy "horse"
Dragon Rampant is a nice, fast game with easy to learn rules and ideal for a relaxed gaming session. The profiles for the most part make sense, with one or two oddities (hello greater warbeast). I reckon it wouldn't take too much effort to conjure up some traits for each race to further differentiate them on the battlefield and add a little more flavour. All in all though, it's a decent little game.